Although not advertised particularly as being a low calorie dessert, Aero mousse still meet the criteria for the those having a healthy January. We buy them fairly often anyway as they are a nice light sweet treat after dinner and these have just 85 calories. However my mum spotted that there was a new flavour available in Waitrose, this new Aero Hazelnut variety. It is packed a bright orange-red box and stood out on the shelf nicely. The mousse is a brown in colour and does show off a dominance of chocolate, but you’d expect that from Aero. There is a darker layer of chocolate sauce mixed into the dessert giving it a pretty marbled effect. The flavour is actually a nice balance of chocolate and nut. There is plenty of both flavours and both work together well, reminding me of chocolate hazelnut spreads you have on toast. I was impressed by the richness of the hazelnut taste and thought it would be perfect for nut fans. As they are two of my favourite flavours I found myself scraping out the reminiscence of the tub to get every last bit out. The mousse if very fluffy in texture, and melts in the mouth, so sadly the pot doesn’t last long, but the sweetness hit was just enough. I think this is a lovely addition to the range of Aero mousse desserts and certainly one I'll buy again. 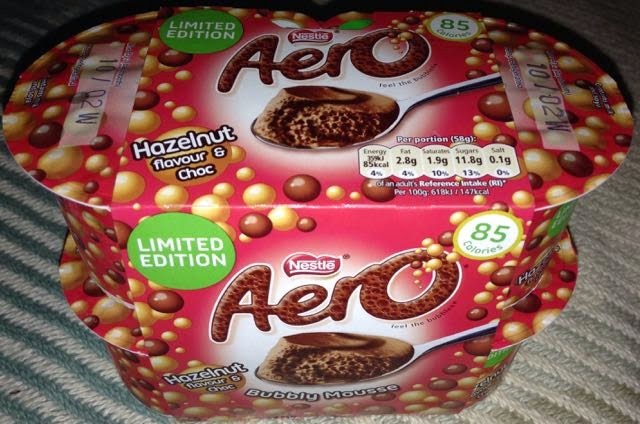 Here is hoping that Aero have plans to release a hazelnut Aero bar, that would really make my day!